Well, it appears an unexpected invasion of homicidal robots went and put the fear of Avis in everyone and accomplished what had previously seemed impossible. Wasting no time in the wake of the Kaylon attack, the Krill have reached out to the Union and began tenuous steps toward a peace treaty. We don’t have a specific timeframe for how long the two species have been at war, though at one point during the episode Ed alludes to the conflict going on for longer than he’s been alive. 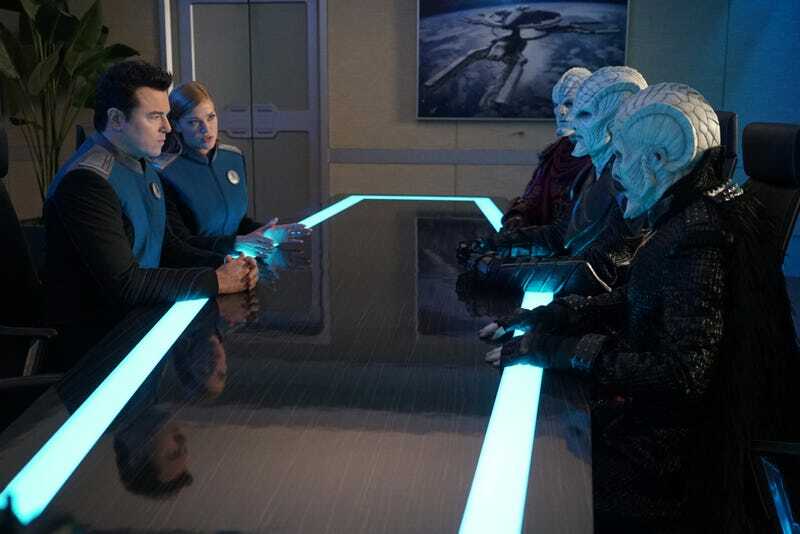 The Orville is tasked with initiating the process, despite being a mid-sized exploratory vessel with no focus on diplomacy. 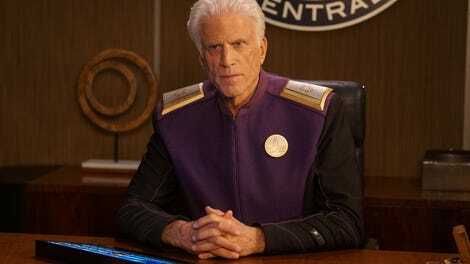 But as Admiral Returning Guest Star Ted Danson on a View Screen points out, even though both of Ed’s encounters with the Krill were by all measure disasters, the amount of time he spent with the race as a result places him in the dubious position of being the Union’s sole expert on the space zealots. But negotiations are nearly broken before they begin as the crew intercepts a Krill shuttle piloted by Orin (Mackenzie Astin), a prisoner of war, and an old friend of Gordon’s from Union Point. Orin and his daughter Layna (Sarah Scott) escaped from a prison camp, but the Krill insist the pair managed to destroy three space cruisers in the process and demand their return. This seems impossible, since the tiny shuttle has nowhere near the capabilities of taking down a warship, but the Krill insist they be returned, lest talks are nullified. “Blood of Patriots” really demonstrates how The Orville generally, and Seth MacFarlane’s writing specifically, have improved since season 1. While it isn’t a particularly stand-out episode, it shows just how much higher the baseline for the show has become. It’s still clunky in parts: it hinges on a plot reveal that feels lifted from nowhere, it teases at the edges of the motivations for suicide bombing in a way neither the episode’s pacing nor Macfarlane’s writing quite have the wherewithal to address in a meaningful way, and the episode’s biggest jokes are a couple of urine sample and rectal exam gags that feel increasingly out of place. But it’s also a well-crafted premise that kept me engaged throughout the entire episode. Entering into a very delicate and tricky peace process only to introduce a wrinkle in a completely sympathetic character like Orin created real tension as well as a lot of great character moments as each crew member struggled with deciding what price peace between humanity and the Krill is worth. This is especially true for Gordon. The show has been long overdue on delivering a Gordon episode. Especially in light of John’s graduation to chief engineer, Gordon has become the de facto goofy reaction guy, and often not much more. Here, he’s given something a lot more substantive as he struggles with his own guilt over the Krill attack that Gordon escaped only because Orin rescued him, leading directly to his capture. In their interactions, you see Orin try and brush off Gordon’s regret, only to let deep resentment bubble up to the surface. Which, as nearly everyone on the crew, even the most suspicious of Orin’s behavior, have to concede is perfectly legitimate. So Gordon has to contend with his sense of obligation to a man who may very well be broken, Ed has to find the truth of how or if those warships were destroyed in order to prevent Orin’s extradition to the Krill, and Talla has to pursue her instincts that something is off about the whole situation. While it was easy to intuit from the moment she was introduced that Orin’s companion was going to be the key to this whole thing, the reveal that she is not his daughter —but instead a hereto unknown species of humanoid aliens that have highly volatile blood— was interesting, but also out of nowhere. I’m not going to ding the episode for it too much, because as I’ve stated multiple times in the past —I’m a simple man who is easily satisfied enough by the mere concept of someone using blood bombs to destroy warships even to the expense of more sophisticated storytelling— it does rob the story line of a chance for a thematic through line. Instead it was just a plot thing that happens. For a fair amount of us watching, I assume Layna’s character immediately invoked Firefly’s River Tam as someone who was experimented on by the Krill and turned into a super weapon Orin used to extract revenge. And while it’s better that the show did its own thing, its own thing was also completely random and impossible to intuit from anything we had watched. Again, this is not a major crime against storytelling. It just demonstrates that one lingering weak spot of MacFarlane’s writing is his tendency to write a script where a bunch of things just occur. I mean, her blood is literally a weapon. If you’re looking for easy symbolism about how a person’s prejudices and hatred can corrode them and infect subsequent generations, you can’t do much better than actual weaponized blood. But maybe Layna has another story. According to IMDB, she returns for the next new episode, so there’s an opportunity to build on her character in a more satisfying way. Ultimately, Orin decides death is preferable to the possibility of returning to Krill prison. But even without the threat of captivity, he’s so incapable of letting go of his pain that dying is better than living to see peace made with the race that tortured him and took his family. And while sad, it’s still understood that everything Orin feels is completely legitimate. So legitimate, in fact, that his self-destruction prevents Ed from having to make an impossible decision. The Krill are apparently satisfied enough with Orin blowing himself up that they’re willing to continue with treaty negotiations. Ed and Gordon meet to make peace over the jealousy Ed felt between Gordon and Orin’s friendship. It was a weird little subplot of the episode that didn’t make much sense to me on account of how fast everything was occurring, but it did provide the show an opportunity for two adult men to have an honest conversation about their feelings with each other, so that makes it worthwhile. Next week’s a repeat, so see you in two for more… I dunno. Astro-shenanigans? Lt. Yaphit was awarded the Sapphire Star for his efforts against the Kaylon war machine. I would have enjoyed it if Ed just gently pushed the medal into Yaphit’s body, where it would float, suspended, in quiet dignity. This is nitpicky, but all the track marks on Layna’s arms were human blood-colored. I’m sure they wanted to hold off on the yellow blood reveal until the bloody nose, but perhaps there was another way to handle it? I do like that the show dedicated and entire, seemingly purposless scene where Talla shows off her holophonor. Maybe at some point we’ll get an episode where she strikes a bargain with the robot devil.